There seems to be no trailer for Garden State on the internet. How weird is that!? Garden State is a cult classic that many people have strong opinions about. It was a surprising movie that still seems to hold up even all these years later. 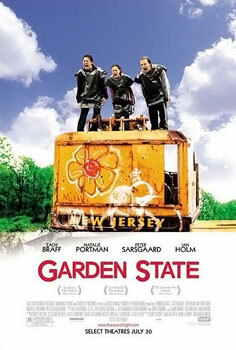 Garden State is one of those films that is difficult to talk about because it comes down to personal preference. In my opinion, you just have to watch for yourself. Andrew Largeman (Zach Braff) is a struggling actor who returns home to New Jersey in order to attend his mother’s funeral. At the doctor’s office, he meets a girl named Sam (Natalie Portman) who is a pathological liar but Andrew is instantly drawn to her and the two begin spending time together. The rest of the film is really about Andrew reuniting with the people from his past and attempting to make amends with his psychiatrist father (Ian Holm). Honestly, one complaint in this film is that nothing really happens except for a lot of angst and drama. Personally, I can see why this would bother a lot of people, but for me, I enjoyed the writing. Maybe it’s not the most unique plot in the world, but the writing from Zach Braff still feels real and heartfelt. The story seems written exactly for those who are in the awkward and overwhelming middle 20’s, and there really isn’t enough films directed for that age group. I think that’s partially why so many people relate to this film. It may seem depressing but that’s part of what makes the whole thing completely relatable. The plot doesn’t shy away from depression which I think is an important subject to include. I’ll be honest, I don’t think Zach Braff is the best actor in the world. He seems to play the same exact role over and over again and that can get kind of old really quickly. However, I respect him as a writer and a director and I think he excels at that. As far as his acting alone for this role, he still was the best person to play this role. No one can deny the fact that he completely nails the part of the depressing and monotone guy, even if he does act that way pretty frequently. Natalie Portman is one of my favorite actresses and she’s amazing in this one. Some film critics have complained that the role of Sam is a “manic pixie dream girl” who doesn’t really have any purpose except to make the male lead better. While that might be true to an extent, I personally thought that Sam was a great and quirky character. The role seemed like it was written specifically for Natalie Portman, it couldn’t have been any better. This was Zach Braff’s debut writing and directing performance and I thought he played the role of director surprisingly well. Braff did an amazing job at showing off the beauty of different smaller communities in New Jersey, including his own hometown, while also filming in two larger cities: New York and Los Angeles. The camera work as a whole wasn’t particularly memorable, but it was still filmed with care and personal touch as well. My personal favorite part of the film was the music, which Braff handpicked himself. Typically, this isn’t something directors really do but this was a unique type of film. All of the songs he picked were absolutely perfect and made complete sense. I’ve never seen a movie that had song after song that actually captured all of the emotions in the plot. I think he definitely proved his worth as a great director who is filled with potential. Garden State is a special and personal type of film. It’s something that people can relate to: the loneliness that the characters feel in the movie is something that pretty much everyone has felt at one point or another. This film may not please everyone, but it still is considered a cult classic for a reason. It makes you feel something, and isn’t that what every good movie should attempt to achieve? It’s safe to say that Garden State is a memorable movie that people still continue to quote and reference.